...[T]here could be a growing role of at least some branches of al Qaeda or other Islamist terrorist groups now willing to help move or protect the drugs as they move north. The crash indicates the cocaine was not going to be moved to Europe via boats, as it was far inland. 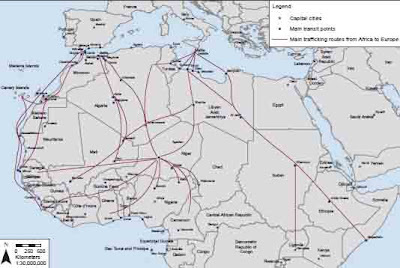 The Tuareg and other groups that control the smuggling routes north through the Sahel will be making much more money as they move into the cocaine protection and movement business, much as the FARC in Colombia found itself awash in cash when they did. 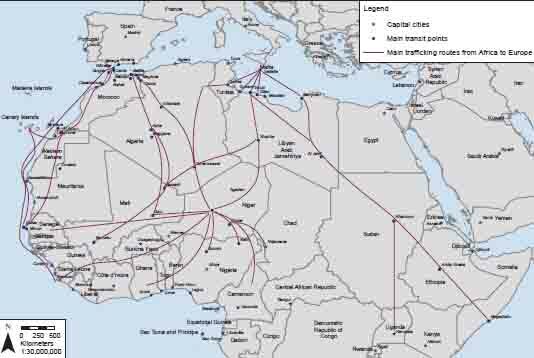 Smuggling routes from Mali proceed to Mediterranean ports in Morocco or in Tunisia and Lybia. While this pattern could confirm Farah's thesis that FARC, Venezuela, and Al Qaeda in the Islamic Maghreb (AQIM)are linked, it also could confirm the thesis that cocaine smugglers are opportunistically developing new routes as circumstances indicate. Since the routes end on the Mediterranean, the transshipments we now observe heading toward the Balkans make sense.